When it comes to finding leading brand vacuum cleaners Beverly MA area residents and businesses come to North Shore Vacuum and Appliance. For 80 years, this shop has been handed down from generation to generation with guiding principles in hand. We remain dedicated to our customers, to providing them a local, superior customer service experience while offering top quality vacuum cleaners at competitive prices. 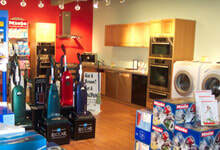 We have vacuum cleaners of all types and sizes - truly, something for everyone. Swing into the store today to shop for your next machine, or to talk to us about any needed repairs or central installation options call us at (978) 774-1155. As your local expert on vacuum cleaners Beverly MA area residents can trust North Shore Vacuum and Appliance to provide the answers and the products you are looking for.